Reeves™ manufacturer HDT Global sells and services a full line of emergency medical products and accessories, including fully-operational rapidly deployable emergency treatment facilities; command and control shelters and trailers; decontamination systems and accessories; patient movement equipment and gear bags. As a premier first responder equipment supply company, all of our products are manufactured within the United States and adhere to the highest standards of quality and durability. 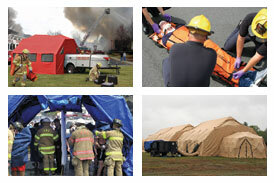 To maintain its superior quality, Reeves™ shelters, stretchers and decontamination systems have gone through rigorous testing and continuous product evaluation. Most Reeves™ medical, command and control, isolation and decontamination shelters utilize the Deployable Rapid Assembly Shelter (DRASH™) system, a durable, quickly deployable design that has been tested for military use. The DRASH™ shelter's integrated electrical, lighting and environmental control technologies provide a complete system at a fraction of the price of hard-walled systems, while allowing for the same amenities. The Reeves™ brand's full line of patient movement equipment, including stretchers, spine boards, body bags and extrication equipment are well-known for their quality, durability, and innovative designs. The most popular is the Reeves™ Sleeve, which is designed for rapid patient immobilization during transport, and can also be used for vertical or horizontal extrication or confined space rescue. Equally well known is the Reeves™ 101 Flexible Stretcher, a durable stretcher that can be folded and handlifted to an incident where multiple stretchers are necessary. Reeves™ also offers ready-made and custom gear bags as well as a full line of decontamination accessories – ensuring that you are ready for anything.